The Mail on Sunday has featured the use of Kaspar at TRACKS Autism, a specialist early years centre in the Hertfordshire town of Stevenage for children with an autistic spectrum condition. The article covered the recent modification that researchers have made to Kaspar, including enabling KASPAR to use a knife and fork, comb his hair and brush his teeth - skills that are designed to help children with autism at home with personal hygiene and issues around food and eating. 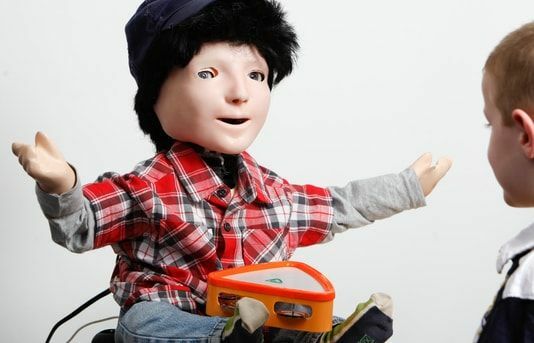 "His mum sent him in with a box of biscuits, and with Kaspar's encouragement over the course of ten weeks, he eventually got to the stage where he would put a biscuit on the robot's lap and sit with him and the other children at the snack table and eat a biscuit himself. Think robot companions are the stuff of sci-fi fantasy? Well, for autistic children... they're already here.